Two of Rock Hill’s police captains will rotate as acting police chief in December as the search for retiring Chief John Gregory’s replacement continues. Gregory’s last day as chief is Saturday, and then captains Chris Watts and Steve Parker will split chief duties. Gregory announced on Oct. 8 that he will retire after spending 40 years in law enforcement, including nine years as Rock Hill’s top cop. The vacant position has attracted about 100 applications from as far as Arizona, City Manager David Vehaun said. “I feel good we’ve gotten the word out on a nationwide basis,” said Vehaun, adding that applications are still rolling in. The search has moved as quickly as possible, he said, and the city will likely hire Gregory’s successor by early January. The department doesn’t “like being without a chief,” he said. The National Association of Chiefs of Police will assist Rock Hill by conducting in-depth background checks on finalists, Vehaun said. Vehaun held two input sessions in November to solicit public opinion on the hiring process. The city also conducted an online survey. Employees and officers with the Rock Hill police department have also met with Vehaun since the search for a new chief began. The department’s leaders, he said, feel comfortable with the police captains temporarily taking over chief duties. Gregory, 57, was hired in 2003 as Rock Hill’s first black police chief. His tenure has been noted for the addition of new technology, more neighborhood-focused police patrols through the Weed and Seed program and outfitting a street crimes unit with new officers. Vehaun expects many of the candidates for chief will come from within Rock Hill’s police force. Gregory made major changes to the department’s leadership position when he arrived from High Point, N.C..
Second Amendment activist John Snyder writes on his blog today that confidential sources have told him that the Obama administration may attempt to skirt Congress and outlaw semiautomatic firearms and multiple capacity ammunition feeding devices under Title 2 National Firearms Act items under the Gun Control Act of 1968. Clinton’s Street Sweeper classification cited as precedent. “Under this scenario, semiautomatics and high capacity magazines could be acquired only with great difficulty and at great expense by America’s estimated 100 million law-abiding firearms owners,” Snyder explains. Prior to Obama’s reelection earlier this month, it was rumored that notorious gun-grabber Dianne Feinstein instructed her legal staff to meet with the legal staff over at the BATF to discuss possible legislation outlawing semiautomatic firearms, according to sources cited by The Shooting Wire. The legal staffs reportedly also talked about banning pistol grips and “high-capacity” magazines. Lawrence G. Keane, Senior Vice President, Assistant Secretary and General Counsel for the National Shooting Sports Foundation, allegedly forwarded information confirming the meeting and its objectives, according to David Codrea. The so-called Street Sweeper was reclassified as a destructive device in 1999 and requires an owner to register it with ATF within 30 days. Failure to do so may result in a $250,000 fine or up to 10 years in prison. Moreover, following the reclassification, the ATF contacted all purchasers of record of the shotguns and told them the weapons are now considered destructive devices and that they must be registered with the government. John Snyder is a noted gun rights activist. He has been called “the dean of Washington gun lobbyists” by The Washington Post and The New York Times, a “champion of the right of self-defense” by The Washington Times, and “the senior rights activist in Washington” by Shotgun News. Black Friday gun sales hit an all time record high last week with demand for new firearms so overwhelming that it caused outages at the FBI background check center on two separate occasions. Fueled by fears that the Obama administration will go after gun rights during a lame duck term, the FBI reported 154,873 background check requests on Friday – a 20 per cent increase on last year’s record total of 129,166 checks. The number of guns sold could actually be double or more that figure because only one background check is recorded per sale even if buyers purchase multiple firearms. “With the recent election, some people are making buying decisions just in case something (new law) happens,” Don Gallardo, manager of Shooter’s World in Phoenix, told USA Today. Gun stores noted that first time gun owners and women represented a significant number of those purchasing firearms on Black Friday. President Obama indicated during the presidential debates that he would pursue an assault weapons ban, which second amendment activists see as merely the first step towards wider gun control regulation. But it’s not just Obama’s conduct on the domestic front that has second amendment activists concerned. The Obama administration’s willingness to sign up to a United Nations global arms treaty which threatens to outlaw guns in the U.S. is also driving firearms sales. Final discussions on the Arms Trade Treaty (ATT) are set to take place in March next year. The New American notes that, “Section III, Paragraphs 7 and 8 of the Programme of Action mandate that if a member state cannot get rid of privately owned small arms legislatively, then the control of “customs, police, intelligence, and arms control” will be placed under the power of a board of UN bureaucrats operating out of the UN Office for Disarmament Affairs,” opening the door to UN peacekeeping forces to disarm American citizens. Deputy Sheriff Stan Lenic, the cop who stood up for the First Amendment by refusing to impede the free speech rights of activists at Albany International Airport, has become an Internet icon, with messages of support flooding in to the Albany County Sheriff’s Office and Lenic being honored with a commendation. A video that has now gone viral on You Tube shows Lenic refusing to follow the demands of Albany Airport’s PR director Doug Myers in having activists Jason Bermas and Ashley Jessica identified, detained or removed for handing out flyers warning travelers about the dangers of airport body scanners as part of the Opt Out and Film campaign. “Obviously this is your constitutional right, OK? As far as you’re concerned, you’re not breaking any laws. That’s what we want to get across to you guys,” Lenic told the activists, dismissing efforts by Myers to have the two kicked out of the airport. The Albany County Sheriff’s Office has since been bombarded with hundreds of positive emails and calls from liberty lovers championing Lenic for his fine work in defending the First Amendment against petty enforcers like Doug Myers. Comments on YouTube were also overwhelmingly supportive of Deputy Lenic. “Finally a cop that does his job properly. Makes a change from all of the bad cop films we’ve seen lately. Hats off to the man,” wrote one. “This Sheriff is an absolute paragon for justice,” added another. Lenic already has his own Facebook page where people are reposting the video and urging Lenic to run for Mayor. “That’s a little overwhelming. I mean, I was doing my job I felt I was doing the right thing protecting people’s First Amendment rights,” Lenic told NewsChannel 13. Lenic also told Bermas that his superiors were considering giving him an official commendation for his exemplary actions in defending the constitutional rights he swore to uphold. Legendary game show host Chuck Woolery has a message for Americans, and he delivers it with an AR-15 in hand. There is no doubt that it’s a tragedy when anyone takes the life of another without cause. But to blame assault weapons for this tragedy would be like, well, blaming airplanes for the 9-11 attacks. The problem lies with the perpetrator, not the tool used to commit the crime. As of right now, the Constitution is still the law of the land. And since we are a nation of laws and not men, we need to follow it carefully. The second amendment allows for assault weapons. 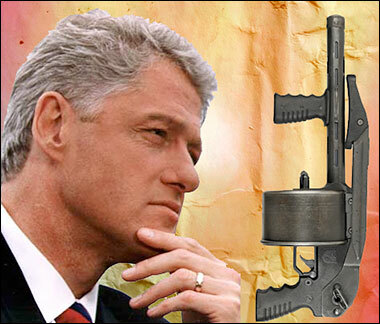 The left argues that the founding fathers didn’t even know what an assault weapon was. As usual, this argument is wrong again. To say that the Constitution limits the kind of guns we can own would be like saying the Constitution limits the kind of religion people can practice. Crazed criminals shooting up innocent people is a tragedy, but all the gun bans in the world will not stop them. Criminals will always find the weapons they need to carry out their crime. The only people that will be going unarmed are the law-abiding citizens like you and me. When you hear people talking about banning assault weapons, know the real assault weapon is the liberal media. With more guns sold in America last year than there are soldiers in the world’s ten largest armed forces, Americans are vehemently rejecting the notion that the U.S. Constitution is an outdated document. Whether it’s California democrat Dianne Feistein attempting to ban rifles across the country, attempts to restrict the purchase of ammunition, or the United Nations making a power-play over America’s sovereignty, the fight for our right to bear arms is in full swing. Victory must be had, because the alternative is a world where the people will forever be wards and slaves of a State bent on total control. “Thank You Cards … personally signed by George,” are now going to be sent to those who donate money to the man facing second-degree murder charges for the Feb. 26 shooting death of Florida teenager Trayvon Martin. Zimmerman, who called police to say he had seen a “suspicious” young man in his neighborhood, has said he acted in self defense. Trayvon’s family and supporters say Zimmerman racially profiled the 17-year-old, should not have continued following Trayvon after a police dispatcher said it wasn’t necessary to do that and that they question whether the teenager attacked the older man as Zimmerman claims. The case spotlighted “stand your ground” laws in Florida and other states, and ignited another discussion about race relations in the nation. There were protests in cities across the country in support of Trayvon’s family and to call attention to what many viewed as authorities’ initial unwillingness to charge Zimmerman. “Michael Dunn, 45, a white software developer from Satellite Beach, went with a gun to the window of an SUV in a parking lot to ask that the black teens inside lower the volume of their music. Reportedly, hot words were exchanged and Dunn fired eight times, killing 17-year-old Jordan Davis. Dunn has been charged with second-degree murder. His attorney is reportedly considering a stand your ground defense. 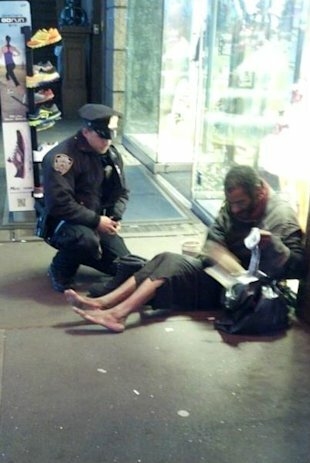 A photo of a New York City police officer kneeling down to give a barefoot homeless man in Times Square a pair of boots on a cold November night is melting even the iciest New Yorkers’ hearts online. The random act of kindness was captured by Jennifer Foster, a tourist from Florence, Ariz., who was visiting the city. Foster, communications director for the Pinal County Sheriff’s Office in Arizona, emailed the photo to the NYPD with a note commending DePrimo. “The officer said, ‘I have these size 12 boots for you, they are all-weather. Let’s put them on and take care of you,'” Foster wrote. “The officer squatted down on the ground and proceeded to put socks and the new boots on this man. Foster’s photo was posted on the NYPD’s Facebook page on Tuesday, where it received more than 320,000 “likes,” 77,000 “shares” and 20,000 comments—most of them praising DePrimo, who seems to have restored Facebook’s faith in humanity. “This is one hell of a police officer,” Desiree Wright-Borden wrote. “Angels truly do walk on earth!! !” Charlene Hoffman-Pestell wrote. Autonomous vehicles and flying drones that would disable a suspect’s car remotely with an electromagnetic pulse are set to patrol highways by 2025 according to a number of concept vehciles designed by major manufacturers such as Honda, BMW and General Motors. The 2012 LA Design Challenge asked companies to come up with a concept for “Highway Patrol Vehicle 2025,” with the winner set to be announced next week. Most of the entrants for the competition have responded with designs that overwhelmingly suggest “patrol cars and motorcycles would be replaced by computerized drones,” within the next 10-15 years, reports the New York Times. Honda’s entry, the Honda CHP Drone Squad, includes both a four wheeled drone vehicle and a two-wheeled motorcycle-style drone, both of which would hunt down suspects without the need to be manned. BMW’s DesignworksUSA studio came up the E-Patrol (Human-Drone Pursuit Vehicle), which would allow the operator to deploy an airborne armed surveillance drone which would have the capability to disable a suspect’s vehicle using an electromagnetic pulse. One of the concept drawings for the BMW design shows a license plate scanner within the vehicle which automatically brings up a photograph of every driver on the road, whether they are a suspect or not. “By coincidence or destiny, designers at several companies came up with concepts for robotic, autonomously driven vehicles on ground, water and air. These future police cruisers — usually presented as story boards rather than actual vehicles — recall today’s Predator and Global Hawk drones, stars of the anti-insurgency efforts. They may give new meaning to those signs that read “Speed limit enforced by aircraft,” writes the Times’ Phil Patton. As we have previously highlighted, the whole direction of drones and automated robot technology being developed by the likes of DARPA is all geared towards having machines take the role of police officers in pursuing and engaging “insurgents” on American soil. Technology experts have warned that removing the human element from law enforcement could lead to people being summarily executed. Two Utah fugitives wanted on thousands of dollars in felony drug warrants were arrested in Mexico after an intense high-speed chase that came after cooperation between the U.S. and Mexican governments and a bail enforcement agent. 34-year-old Jacqui Randall and her boyfriend 40-year-old Lorin Fiene were arrested in September for allegedly selling meth out of their Layton home, but after bailing out of jail, police say they skipped out on their bond and made a run for the Mexican border. A few years ago, that would have made them virtually untouchable, but new cooperation between Davis County drug officers, U.S. Marshals, Mexican police and the work of Jim Elliot, a Utah bail enforcement agent, helped crack the case. The stakes were high for Elliot in this case; Fiene and Randall had skipped out on more than $110,000 in bail. He flew from Utah to California, rented a car then crossed the border at Tijuana into Mexico. Tipsters led him to Ensandada, then to San Felipe, almost 120 miles south of the Mexican border. As a bounty hunter in Mexico, Elliot could neither carry a firearm nor take part in the arrest, but he did his best to bring police from both countries together. “I said, ‘What if I get you an exact address in Mexico? If I get eyes on and I call you with GPS coordinates?’ They said, ‘You get that and we’ll get them out of there.’ I said, ‘I can do that,’” Elliot said. After more than two days of surveillance, he was able to locate the couple. Mexican agents then allowed Elliot to ride along with them. He documented most of the operation on his smartphone. A high-speed chase that reached speeds of 115 miles per hour through the streets of San Felipe and crash led to the apprehension of Randall and Fiene. “Their faces say it all, they were stunned. They’re probably still stunned,” Elliot said. Fiene and Randall are currently in a federal holding facility in San Diego awaiting extradition back to Utah. Elliot says this is the first time he’s heard of an operation like this in Mexico. It used to be completely unheard of, but the U.S. and Mexican governments have forged new cooperation that makes these arrests possible. “The Mexican government will not tolerate American citizens that are fugitives in their country, we never have any issues,” said Frank Smith, special agent in charge of the Drug Enforcement Agency in Utah. Elliot says this case should serve as a warning for other fugitives who believe fleeing to Mexico will keep them safe from arrest. Andrea Hernandez won’t have to leave her high school for refusing to wear a badge designed to track her every move there – yet – her attorneys announced today. A district court judge for Bexar County, Texas, has granted a temporary restraining order to prevent Northside Independent School District from removing a Hernandez from John Jay High School’s Science and Engineering Academy because she refused to wear a name badge designed to use a Radio Frequency Identification (RFID) chip to track students’ precise location on school property, the Hernandez’s attorneys announced today. “The court’s willingness to grant a temporary restraining order is a good first step, but there is still a long way to go—not just in this case, but dealing with the mindset, in general, that everyone needs to be monitored and controlled,” said John W. Whitehead, president of The Rutherford Institute. “Regimes in the past have always started with the schools, where they develop a compliant citizenry. These ‘Student Locator’ programs are ultimately aimed at getting students used to living in a total surveillance state where there will be no privacy, and wherever you go and whatever you text or email will be watched by the government,” Whitehead warned. The school had reportedly offered to allow Hernandez to wear a non-functional badge, giving the appearance of support for the program, but she declined. CNSNews.com is not funded by the government like NPR. CNSNews.com is not funded by the government like PBS.